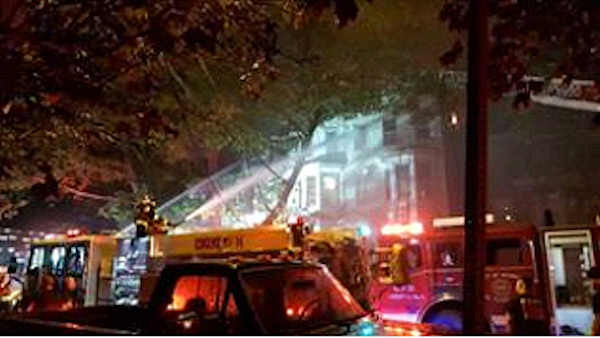 NEWARK, New Jersey (WABC) -- 28 residents were left homeless after a a 4-alarm burned through several buildings in Newark Sunday night. The fire broke out shortly before 11 p.m. at a three-story building on Pennsylvania Avenue and spread to a total of four buildings, three of which were occupied. The fire was elevated to 4 alarms with more than 100 firefighters responding. It took until about 2:40 a.m. to bring the blaze under control. The Fire Division's Community Service Unit and the American Red Cross are making arrangements to assist the 21 adults and 7 children displaced by the fire. The cause and the origin of the fire are eing investigated by the Essex County Prosecutor's Office Arson Investigation Unit and the Newark Fire Division's Arson Squad. Only one person was injured during the incident, a firefighter who was taken to UMDNJ for evaluation. Anyone with information about the fire is urged to contact either agency's arson investigators.